Usain Bolt won the 200 metres gold at the World Athletics Championships in a World record time of 19.19 seconds on Thursday. The Jamaican, who dominated the 100 and 200 metres at last year's Summer Olympics, was already the story of the World Championships after winning 100-metres title, bettering his own World record with a time of 9.58 seconds. The new mark bettered the previous record of 19.30 seconds he set in the 200m final at the Beijing Games. It was stunning run in front of a capacity crowd at the Olympic stadium. 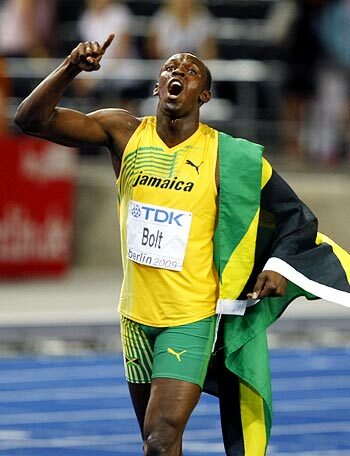 Bolt, who will be 23 on Friday, can add another gold to his haul in the 4x100m relay.